We actually eat meatless meals more often than not. I’ve found it to be an easier way to cook, healthier, and cheaper. 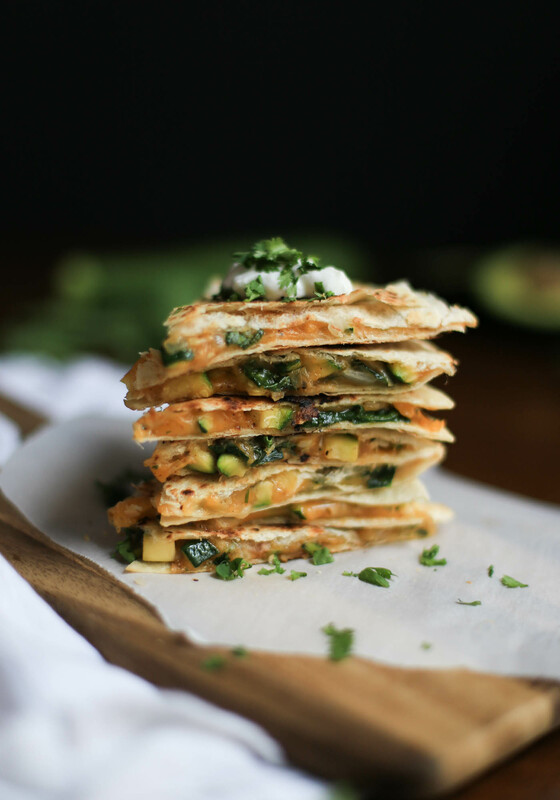 The zucchini, onion, and spinach add some healthy points to the quesadilla, instead of it being all cheese, and you won’t miss the meat; I never do. It also makes the whole process quicker, which is really wonderful when you get home from work after a long day. I got the idea for what I actually call ‘grown-up quesadillas’ at a friend’s birthday party with a Mexican-themed potluck. Someone brought delicious quesadillas filled with diced broccoli (!) and onion. And they were so good! This made me seriously question my life choices, or at least why I hadn’t ever thought to add different veggies to quesadillas. 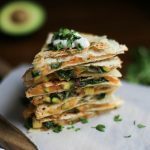 This recipe for cheesy zucchini quesadillas is makes a complete dinner rather than a random snack. To make the filling, finely dice zucchini and onion. (Here’s how to finely dice zucchini–thanks Canadian Living.) 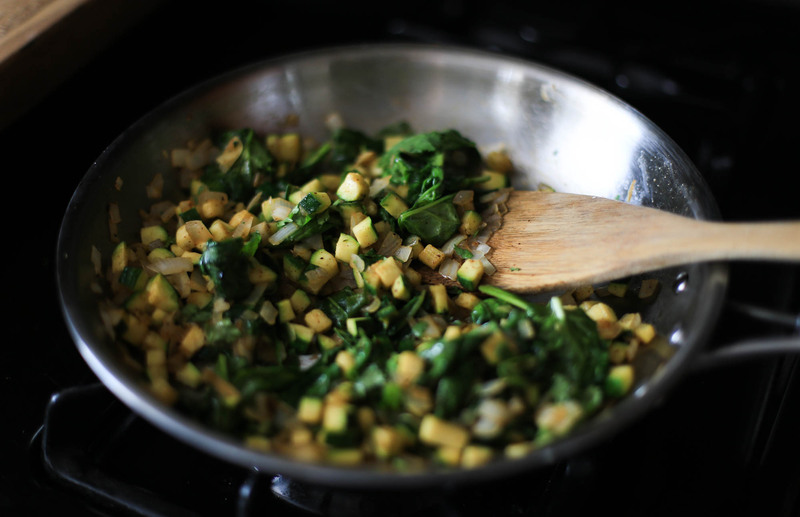 Saute those first, with a few spices if you wish, and then add spinach to wilt. The amount of filling I’ve listed for this recipe usually works well for two large quesadillas. It’s always better to make too much filling then not have enough. (I tried that once, with not enough cheese….let’s say it didn’t go well.) The filling can be made ahead of time, refrigerated, and then assembled later with the cheese and tortilla. Sharp cheese works best, such as pepper jack, Monterey jack, or extra sharp cheddar. I used a combination of Monterey jack and cheddar. If you’d like a crispier tortilla, I recommend lightly brushing one side of the tortilla with a little olive oil (for the side that hits the pan). Also, I always layer my quesadillas with cheese, then filling, then a little more cheese so the whole thing sticks together better. A perfectly gooey cheesy quesadilla. And if I’m being honest, quesadillas are also about the toppings. 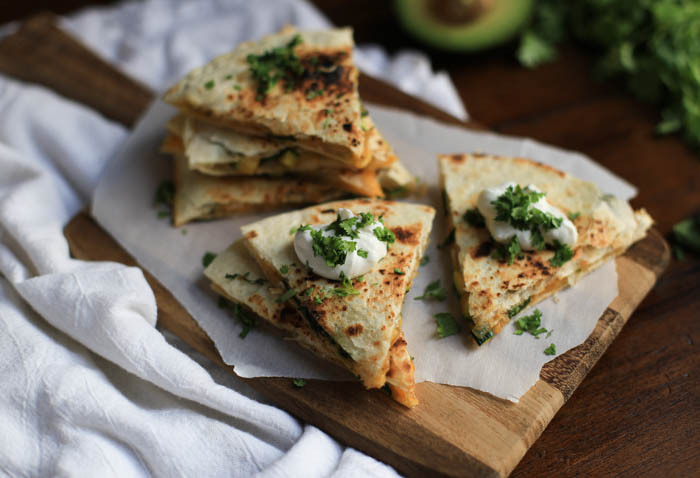 Avocado, sour cream, and salsa can all take your quesadilla to the next level. So don’t be shy. Be a real grown-up. Heat the olive oil in a large skillet over medium heat. Add the onion and saute for 4-6 minutes until it begins to soften. Stir in the zucchini, cumin, and chili powder. Saute for 5 minutes until the zucchini starts to become tender. Add salt and pepper to taste. Add the spinach and cilantro (if using) and stir well until wilted. Remove from heat. Place a separate non-stick pan over medium-low heat. Place one tortilla into the skillet. Sprinkle the tortilla with a thin layer of cheese, and then half of the zucchini mixture. Top with another thin layer of cheese followed by a second tortilla. Cook for a few minutes until the underside is golden brown, then carefully flip with a spatula. Repeat until both sides of the tortilla are golden and the cheese is melted. Repeat step two with the remaining tortillas and zucchini filling. Once done, slide the quesadillas onto a plate, slice into wedges, and serve immediately. Suggested toppings include avocado, sour cream, salsa, and lime.